Please note: All features can be viewed and used in either portrait or landscape orientations. However, some entry methods may vary. Overview: On this screen you can add new recipes; search using the tabbed index; search by category; search by name, ingredient, and category; or select a recipe to edit and/or cook. Tap on the "i" button in the bottom right corner for help or contact information. Tap "+" in top right corner to add a new recipe. The white text at the top will note which recipes are being displayed, based on search or category filtering. This text will say "All Recipes" when no filters have been applied. 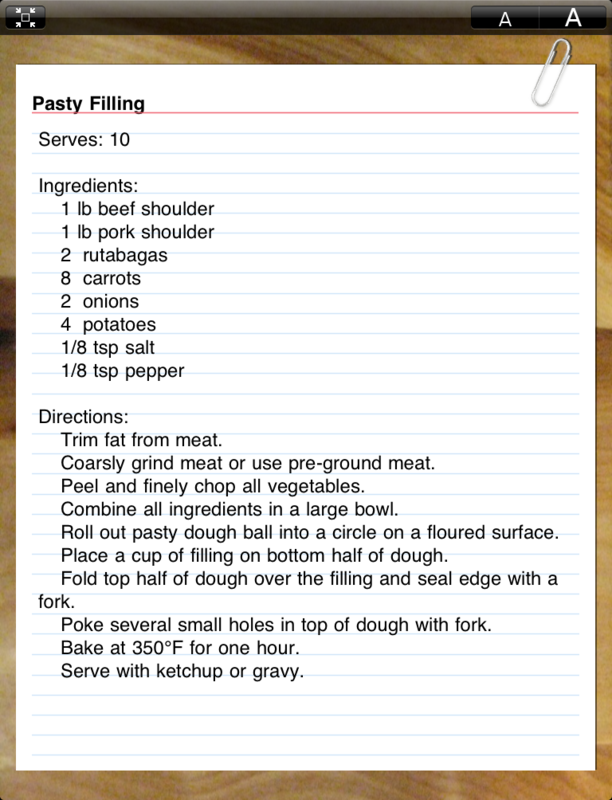 Scroll upward by flicking to view more recipes or tap a letter on the side to quickly navigate the alphabetical index. Recipe index card = edit recipe, including photo. Tap on the "i" button at the bottom of the screen for help or contact information. Toggle between Search or Categories by tapping the search icon (magnifying glass) or the category icon (folder) in the top left corner. Tapping the search icon will bring up a search box. Type in recipe name, ingredient, or category name to search. Recipes will filter as you type. If no recipes match the entry, a "No Match..." message will display. Tap a category row to view only recipe cards in that category. Tap second category in same section to include more recipes. Tap second category in different section to eliminate some recipes. Tap "Clear" at bottom to CLEAR all category selections. When Recipes are filtered, white text at the top will indicate by what. If no recipes meet all the criteria, a "No Match..." message will display. Tap "+" at bottom of the Categories popover to add a new category. Tap "Edit" at the bottom of the popover to move a category into a new section or to rearrange, by using the 'grippers.' Delete a category by tapping on the red circle. Tap " " at top of the Categories popover to Edit Sections: rearrange, delete, or add (by tapping "+" that appears in new view). Tap back button labeled "Categories" to finish. Rotate your iPad to view in portrait. 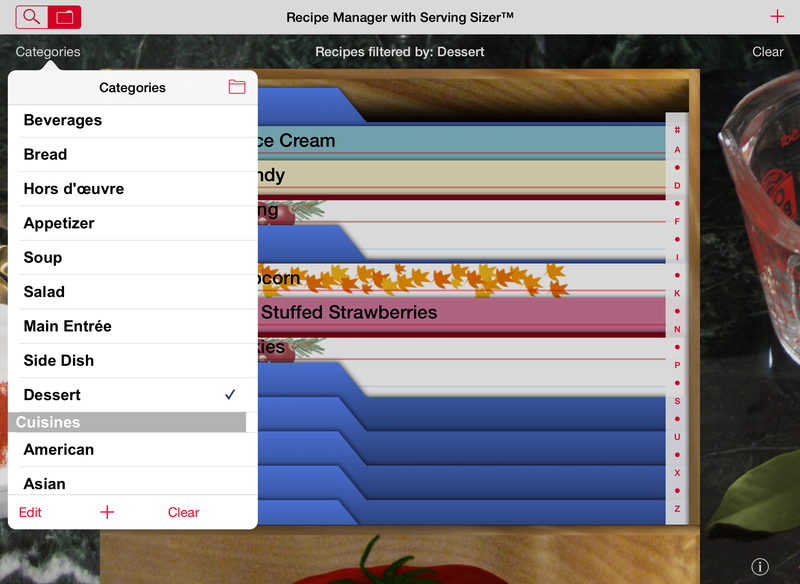 Recipe Manager with Serving Sizer is designed to be used in either Portrait or Landscape Orientations. 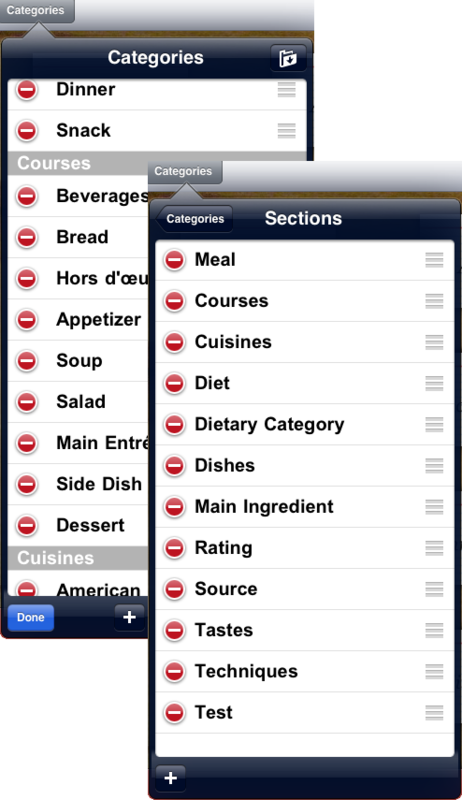 Tap "recipe box" icon to select recipe cards and to search and sort by categories. 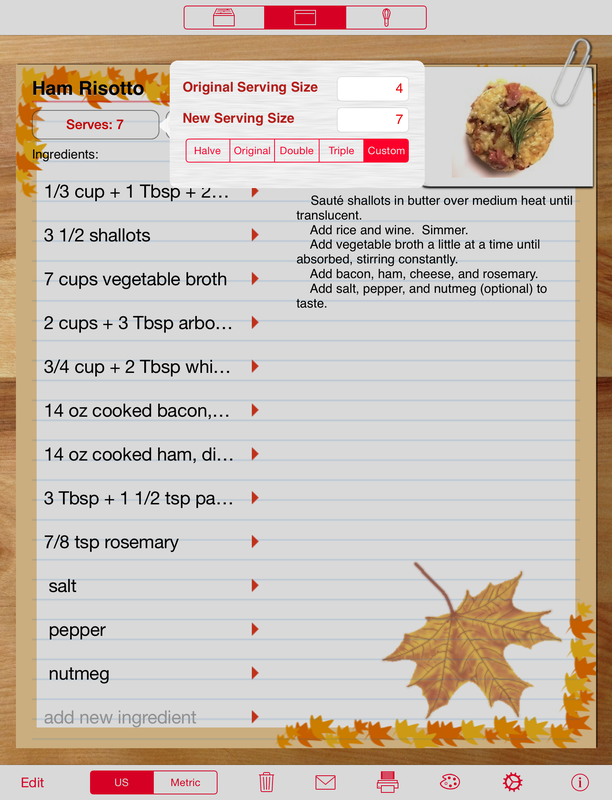 Tap on "whisk" icon to view recipes for Cooking Mode, full screen. Tap on "Recipe Name" to enter the recipe's name. Tap on "Serves" to edit the serving sizes. Enter recipe's original serving size. Enter number of guests for new serving size--change any time your guest list changes. Alternately, select Halve, Original, Double, Triple. Original resets the new serving size to Original number. 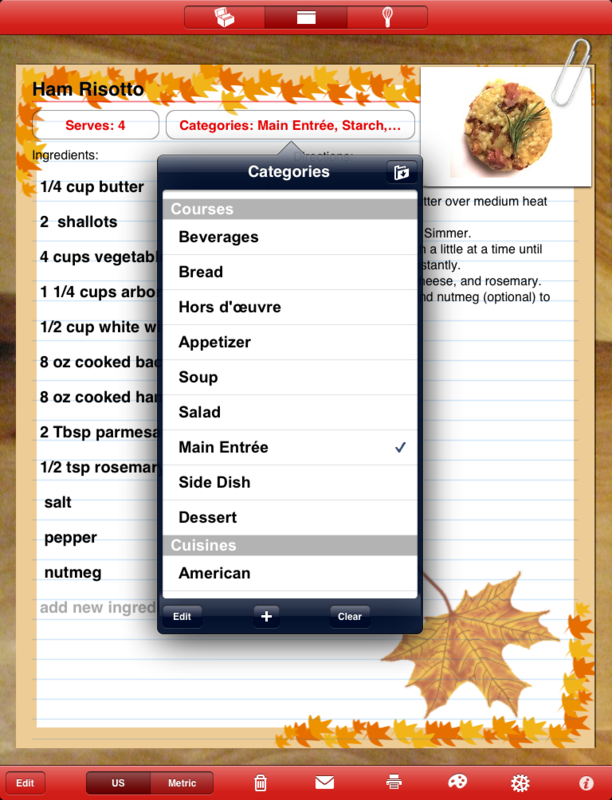 Tap on "Categories" to designate multiple categories for the recipe. 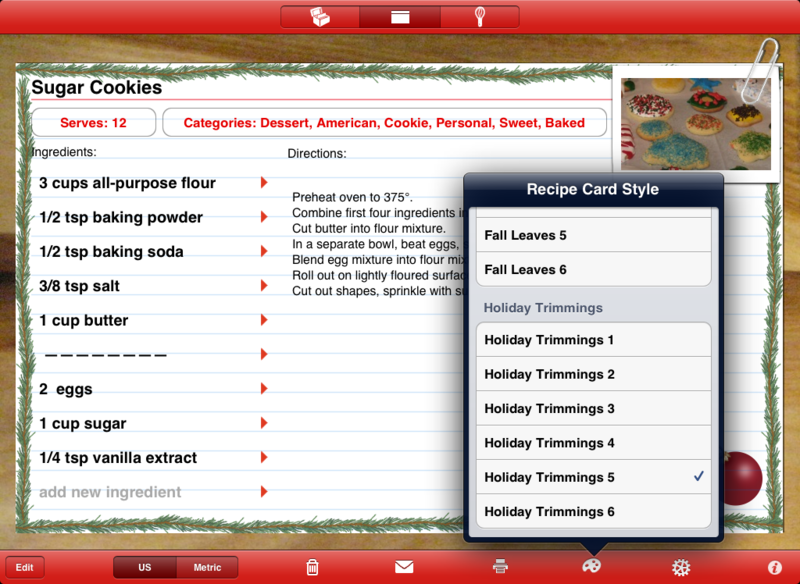 Editing categories and sections is the same as described on the recipe card screen. Tap on "No Photo" to add a photo. Choose from "Photo Albums" on iPad. Tap under "Directions" to pull up the keyboard to enter steps for making the recipe. Flick to scroll directions that are longer than the current view. Tap on "add new ingredient" to add ingredients (see below for more details). Flick in the ingredient area to scroll complete list of ingredients. (add new ingredient will always be at the end of the list, but may scroll off the screen after filling up the column with ingredients--scroll to find). Tap on ingredient row (or red arrow) to edit existing ingredients. Tap Edit to rearrange or delete ingredients. Tap US/Metric to change units. Tap on Trash Can to delete the recipe. Tap on Envelope to email converted recipe. Tap on Printer to print the recipe. Tap on Artist Palette to select Recipe Card Style. Tap on Gear to pick the optimization setting. Tap on "i" for contact, help, and "about" information. Tap Add More to add more free and for-purchase style packs. Enable the free packs or purchase (in-app via iTunes) specialty packs by tapping the price. Preview Styles on our website. Tap back button "Recipe Card Style" to view and select available enabled styles. Just tap on the style name to change the card instantly. Tap outside the popover to accept. or Tap on the arrow to view/edit an existing ingredient. Enter amounts in whole numbers and fractions (using slider). Pick units, sorted by type: Volume, Weight, or Items (for whole items like eggs, or "cans of beans"). Select from 500+ ingredients. Find easily via search or side ABC index, or flick through the list. Tap "+" in popover, at bottom, to add a NEW ingredient name. (Tip: add a row of dashes ---- to for separator). Anything entered in search will pre-fill the new ingredient field. Tap "Edit" to edit existing ingredient names. Names can be as long as you wish. Tap outside the popover to accept changes. Tip: Select zero "0" for the amount, and "Items" for the unit to list ingredient name only, like "salt, to taste". Email converted recipes to friends and family. Tapping the Whisk icon from the recipe card screen or recipe preview moves you to Cooking Mode, at full screen. This screen shows you the complete converted recipe, for ease of use when cooking. Rotate to view in landscape. Tap the font buttons A A in the top right corner to increase or decrease the font size. 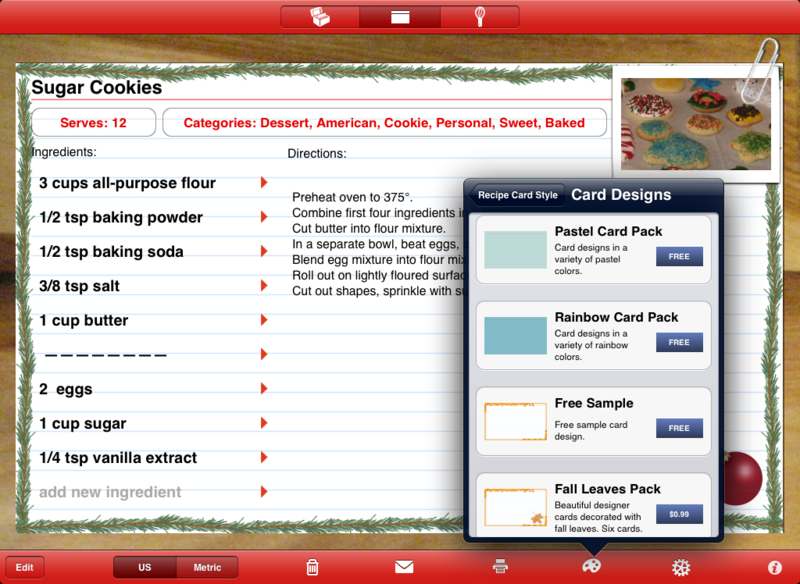 Tap on the recipe box to return to the box of recipes, or the recipe card to return to the recipe card edit screen. iPad will not turn off when in Cooking Mode. Q) How do I enter my own ingredients if they are not in the list? A) When the ingredient list popover is in view, tap on the "+" button at the bottom of the popover. Any text you already entered during search will be preloaded. Q) I've got a complicated ingredient: "4 - 14.5 oz cans of stewed tomatoes" How do I enter that one? A) Use "items" for the type of measurement (the 'egg' icon). Enter 4 for the amount. Then use the "+" to add a new ingredient and type "14.5 oz cans of stewed tomatoes" as the ingredient name. Q) How do I enter directions within the ingredient list? For example I need to add "2 Tbsp olive oil, divided". A) Enter "2" and "Tbsp" in the amount. For the ingredient, you can either edit an existing ingredient (but it changes all the recipes that use that ingredient), or add a new one. Tap on the "+" at the bottom of the ingredient popover. Enter "olive oil, divided" as the new ingredient name. You can enter as much info associated with the ingredient as needed. Alternately, if you have a complicated set of ingredients and do not wish to enter them all into the ingredient part of the recipe, you can enter the whole recipe by hand in the directions area. When you display the recipe for cooking, you'll see the whole text. This method can also be used if you just want to copy/paste a recipe from the internet or email. Merely paste the whole text into the directions area. The only drawback is that you will not be able to use the sizing function, but you can add specific ingredients for recipes as the need arises. Q) How do I backup my recipes? I would hate to lose all that work. A) Just sync with iTunes or with iCloud Backup after entering recipes. All recipes are automatically backed up during sync. We recognize that your recipe data is very important to you, so we've taken extra steps to ensure the integrity of the database. Your entries are all saved as you go. We do recommend that you backup with iTunes or iCloud frequently (or after entering data) as the backup is only as good as the last sync. You can also create a second backup copy while in iTunes on your computer. In the "Apps" tab, scroll down to "File Sharing". 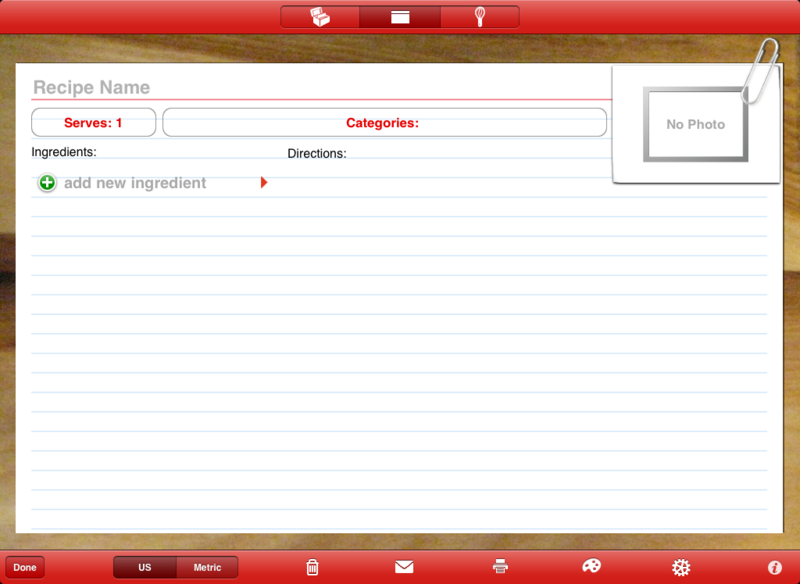 You will see Recipe Manager with Serving Sizer listed. You can make an additional copy of the database to save on your computer. This step is especially useful if you accidentally erase the app from your device, which causes all the data to delete as well (you are prompted that this will happen). If you have the second backup, you can reinstall the app to your iPad, then bring in the backup and restore your data. Apple has written a tutorial on how to do the File Sharing backup (and restore). In addition, you can use the method to transfer the database (overwrite) to the iPhone app, Serving Sizer Recipe Manager. Q) I can no longer find the app on my iPad after I closed it. A) Most likely you didn't close it, but deleted it. There is no way that the app will self-delete. Unfortunately, on the iPad, an "X" badge on the app (while they are wiggling, after you hold down an icon), indicates DELETING the app. When you delete the app, all the data is also deleted as well. You do get an "are you sure?" prompt, but sometimes we are conditioned to just tap on those. Be careful. If you want peace of mind, we recommend making a backup copy after syncing with iTunes, using "File Sharing" (see previous FAQ). The extra back up can be used to restore the data if you delete and reinstall the app. Q) How can I get the recipes into my iPad? Do I really have to type these in? A) Mobile devices can be labor-intensive for data entry, so we are looking at improvements for importing already typed recipes, and recipes on the internet. However, we do already support copy/paste. 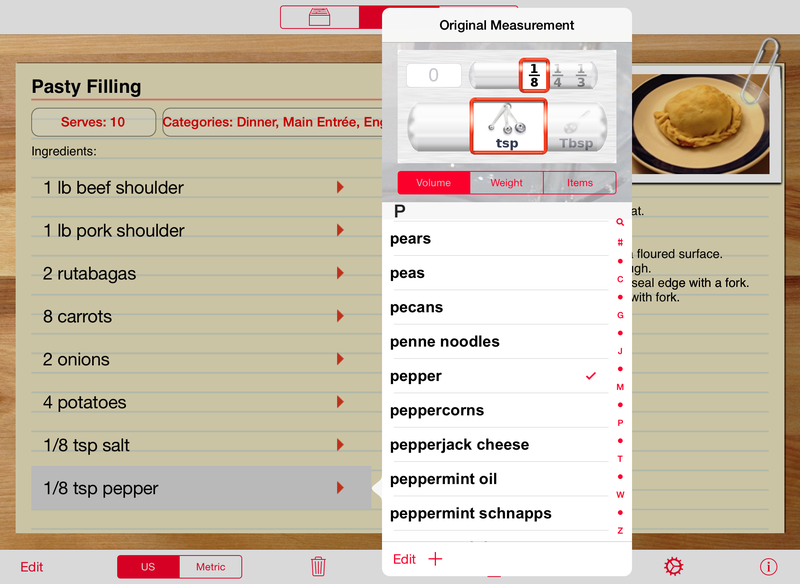 We use Recipe Manger with Serving Sizer in our own kitchen and often pull recipes off the internet (you can also do this by emailing your recipes to your iPad). 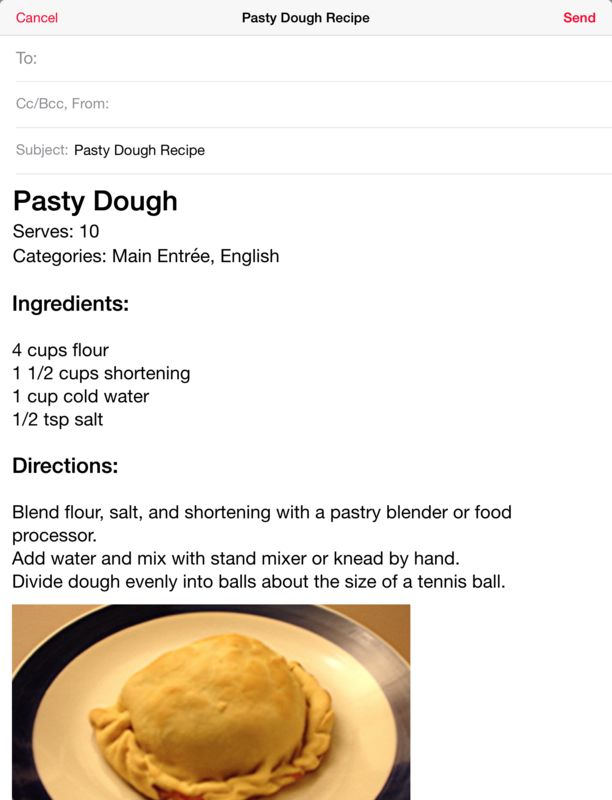 We copy and paste the entire recipe into the "Directions" area of the app. This way we can view everything just fine when in "Cooking Mode" (full screen). When we find the need to resize the recipe, that is when we enter in the ingredients separately. We found it takes but a few minutes to "read" the ingredients from the pasted area in Directions and enter in the ingredients. Our goal for the app was to make data entry as quick as possible. That's why we included 500+ basic ingredients to pick from (but you can add your own), the sliders for entering fractional amounts, and the sliders for picking units. We're always open for suggestions for improvements, so please feel free to contact us with your experiences. Q) I can't seem to add more ingredients after I've gotten to the bottom of the page. A) The ingredients and directions scroll separately. Flick on the ingredient side of the page to find "add new ingredient" which has scrolled off the screen after adding the last ingredient. 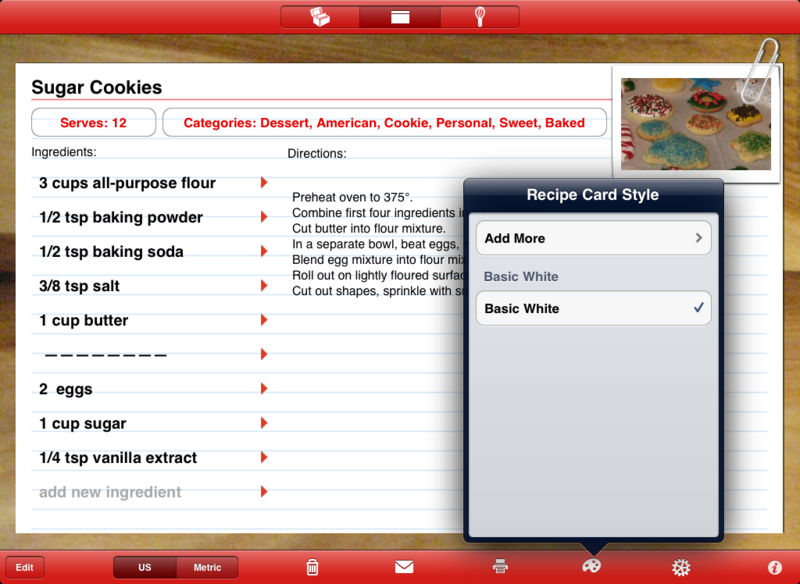 Q) How do I add a color or style to my recipe cards? A) Tap the artist's palette icon on the toolbar to pull up available styles. Tap to select. To add more designs (some free and some for purchase), tap Add More Designs and pick the styles you wish to install. More styles are forthcoming. 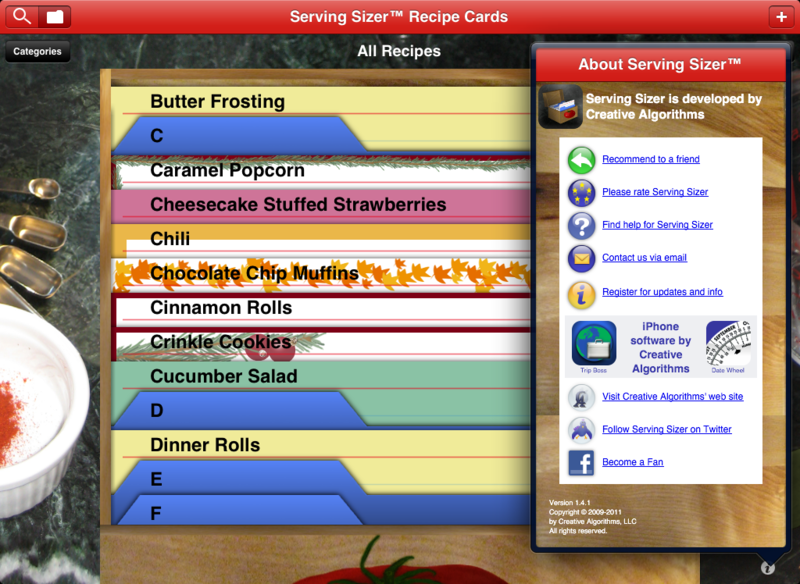 Q) What's the difference between Serving Sizer Recipe Cards and Recipe Manager with Serving Sizer? 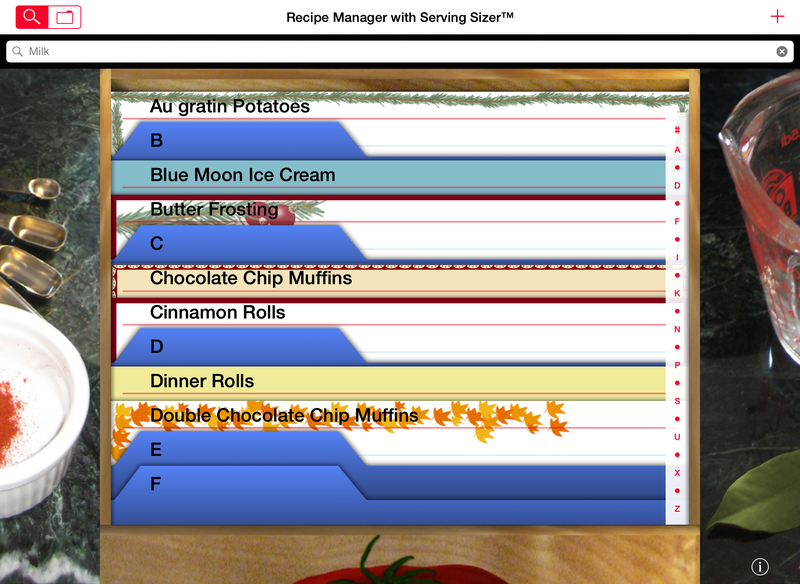 A) Recipe Manager with Serving Sizer is the new name. Based on feedback, we determined that Recipe Manager is a more apropos title for the app, as it manages your recipe collection, doing so much more than just adjusting the serving sizes. It is the same app. 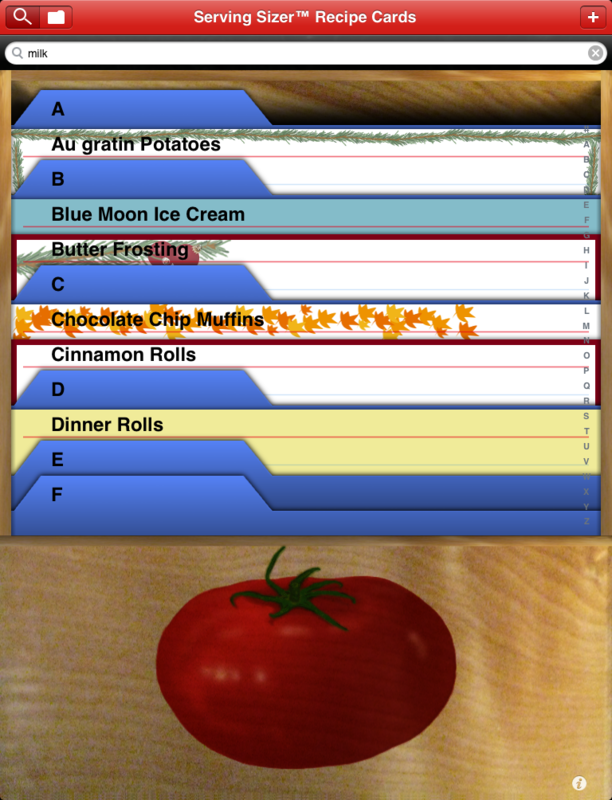 Also, Serving Sizer Pro on the iPhone is the sister app to Recipe Manager. You can transfer the recipe database from either app. The iPhone version is not as feature rich as the iPad version, but is still actively being developed and improved.